In this week’s Torah portion we read about Jacob’s Ladder which provides us with an illustration of the connection between heaven and earth when the Patriarch Jacob dreams during his fleeing from his brother Esau. The significance of the dream has been debated over the centuries, but most interpretations agree that it identified Jacob with the obligations and inheritance of the people whom God has chosen and is drawing to Himself. Rashi opens saying the angels descended to go with Jacob out of the Promised Land. עלים וירדים ASCENDING AND DESCENDING — It states first ascending and afterwards descending! Those angels who accompanied him in the land of Israel were not permitted to leave the Land: they ascended to Heaven and angels which were to minister outside the Land descended to accompany him (Genesis Rabbah 68:12). Studying the Tanach and the Apostolic Writings coupled with the Rabbinic literature, there may be something more to the dream than meets the eye. In the rabbinic literature, the Midrashic approach to Jacob’s dream (see Midrash Rabbah on Bereshit / Genesis 68:12-14) seems to be a hyperbole of the revelation of God at the Mountain of Sinai. The word סֻלָּם, ladder, is equated with סיני, Mount Sinai (see Ibn Ezra on Bereshit / Genesis 28:12 Part 1). The connection is made by the numerical value of the letters in both words are the same (130, Daat Zkenim on Bereshit / Genesis 28:12 Part 1) the rabbis say provides us with a future expectation of the people of Israel standing at the mountain of Sinai with Moshe to receive the Torah. The parallel is in Moshe and Aaron acting as God’s messengers on earth, whereas the angels of God ascending and descending (analogous to Moshe and Aaron ascending and descending Sinai) are also God’s messengers on earth. Other Midrashic descriptions are of the angels Jacob saw as being inquisitive of Jacob to get a close up look at him saying that Jacob’s likeness was engraved upon God’s throne. Ibn Ezra goes on to say in his commentary on Bereshit / Genesis 28:12 Part 2 saying, “And Rabbi Shlomo HaSefardi said that ‘ladder’ hints at the highest soul and ‘G-d’s angels’ hints at wise thoughts.” In addition to this, Ibn Ezra also states in Part 3, “Rabbi Joshua said that the reason for the ladder is that his (Jacob’s) prayer rose on it and his salvation from the heavens came down on it…” He is basically saying that prayer goes up to heaven by way of the ladder, and salvation comes down by way of the ladder. It is interesting how this ladder represents all of these things, Sinai, the giving of the Torah, prayer ascending the salvation of God descending from the heavens. Ibn Ezra says (Part 4) “the ladder here is a metaphor, for nothing is concealed from God. Worldly things hang onto the heavens as though there is a ladder between them, upon which the angels go up to report on things after they have been walking along the earth. Likewise, it is written that other angels descend to fulfill G-d’s tasks, like a king with his servants.” Based upon the rabbinic literature, the ladder symbolized the messengers of God, of the angels seeking to see Jacob whose image was engraved into God’s throne, his prayers ascended and the salvation of God descended upon Jacob by way of the ladder, and how all things are revealed from God (i.e. nothing is concealed from God), and how the angels descend to fulfill God’s tasks and then ascend to report to the Lord what is happening. If we couple this to Yeshua’s words in John chapter 1 (1:51) in the application to himself as being that ladder, and to Jacob fleeing from Esau we find the context of the son of man having no place to lay his head just as Jacob when he was fleeing his brother and having to sleep with a rock as his pillow and in the Messiah all of these things being true. The rabbinic literature provides a rich contextual background on the messianic identity of the Son of Man being connected to Jacob’s ladder. והנה סולם מוצב ארצה, “and (in his dream) he saw a ladder planted on the earth;” at the burning bush, where Moses had his first communication from G–d, the fire from that bush rose to the heart of the heavens. At that time Moses was told specifically that the Israelites, Yaakov’s descendants shall worship G–d there. The use of Jaocb’s ladder analogy from Parashat Vayetze is Yeshua’s way of referring to a prophetic revelation of who he is and of what He had come to do. (see Or HaChaim on Genesis 28:12 Part 1) This is how the Hebrew Text is interpreted וַיַּחֲלֹם וְהִנֵּה סֻלָּם”, And he dreamed that there was a ladder, etc. Inasmuch as many dreams contain matter without significance, the Torah added the word וְהִנֵּה to indicate that in this dream every detail appeared to Jacob as especially vivid and significant. He had total recall of everything he dreamed and referred to each detail later on. This is why the word וְהִנֵּה is repeated before every segment of the dream. The Torah thereby characterizes the dream as a prophetic revelation.” Here in John chapter 1, John testifies of the Word of God descending and dwelling in a human body. The opening sections of John chapter 1 go to lengths to establish the divine origin of the Word of God and then leads on to the expectation of the Messiah. We are told of the disciples telling their brothers what they heard and Yeshua speaks to Nathanael about seeing him under the fig tree (John 1:48) and Nathanael responds saying “Rabbi, You are the Son of God; You are the King of Israel.” Yeshua responds with a seemingly strange response, 1:51 And He said to him, ‘Truly, truly, I say to you, you will see the heavens opened and the angels of God ascending and descending on the Son of Man.’ (NASB) The Jerusalem Targum understands the function of these angels as having been assigned to accompany Yaakov from here on to wherever he went. The rabbinic reason that they ascended was to relay their messages to other angels in the celestial spheres that they had been assigned to descend to earth. They were to show them that there was a human being of the stature of Yaakov on earth. They would recognize him at once as a likeness of his features had long been engraved at the base of God’s throne. (Chizkuni, Genesis 28:12 Part 1 speaks of Jacob in this way.) In Yeshua’s statement using Jacob’s ladder from Parashat Vayetze, he was emphasizing the idea that Nathanael will see greater things than what he had just heard, the Lord knowing him before he had met him. The power of God will be shown forth where the Messiah (the ladder) comes as the messenger of God, to bear witness as the example to live by whose image had long been engraved into God’s throne, through whom in His Name our prayers ascend and the salvation of God descends by way of God’s Messiah (i.e. the ladder). There are significant parallels here in the NT descriptions of the Messiah as compared to the rabbinic literature. What we find here are the rabbis establishing the meaning of the ladder in Jacob’s dream and then Yeshua using these similitudes as referring to himself as the Messiah of God. Taking all of these things into consideration, some Jewish commentators argue that Christianity appropriated the Hebrew bible and turned it to its own non-Jewish purposes and thus distorting its meanings. Other Jewish commentaries as we are seeing here in this week’s study tend to uphold and not destroy the narratives found in the Apostolic Writings providing us with a sort of background for why Yeshua used this ladder to describe himself. Based upon what we have read thus far, the rabbinic literature actually provides some excellent background information in the interpretations of the rabbis for the literary and hermeneutical context of Yeshua’s seemingly out of place statement. What Yeshua was doing was employing a deeply rabbinic teaching technique. Taking all of these things into context, we can see how the New Testament is deeply embedded within Second Temple Jewish life and thought. It is at this point we discover the major distinction between Yeshua and the Apostle Paul. Yeshua spoke to his people who were living in the land of Israel teaching them primarily in Hebrew in a form that was identical to the rabbis (rabbinic method). Yeshua was provincial. Paul on the other hand was international, he worked outside of the Land of Israel, teaching and preaching in Greek. Yeshua spoke to the Jewish people and Paul spoke to the pagan gentiles. Both Yeshua and Paul held a high view of God’s Torah. 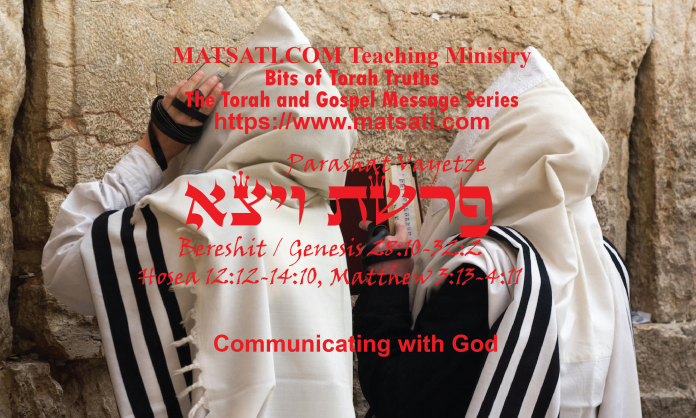 Based upon what we read about Yeshua, he had a thorough understanding of the Torah and the rabbis (oral tradition, Mishnah) and he taught from this point of view. Paul on the other hand took an approach to the Torah that had a new Messianic component. The messianic idea that Paul took hold of was that the Messiah had come and so the Messiah and the Torah both occupied a position of centrality for the theology of the Apostle Paul. Paul was fulfilling the prophesy of Isaiah in the sense of taking the Word of God and His Messiah Yeshua to the nations. Here Isaiah speaks of a future expectation of the Lord God Almighty putting into the hearts of many peoples to go to Jerusalem and worship the Lord, bringing peace to the hearts of men indicated by the beating of the swords and spears into gardening tools never to make wars again. Paul was called to teach the gospel message (the Messiah and the Torah) to a lost gentile world. In light of these things, we can understand how Paul was bringing together both Jews and non-Jews together to form an early community of believers through a meaningful relationship with one another based upon their common faith in God, in His Messiah Yeshua, and in the teachings contained within the Hebrew bible. In light of this week’s Torah portion, the interpretations of the rabbis on Jacob’s ladder that are coupled with Yeshua’s use of the ladder as referring to himself (John 1:51), the conceptual value is of the Lord God Almighty opening the individual to experience God in the dynamics of every day life. “For in him we live, and move, and have our being…” (Acts 17:28). The Messiah comes to lead the way as the messenger of God as the example to live by whose image was engraved into God’s throne, through whom in His Name our prayers ascend and the salvation of God descends. We have a direct communication line to our Father in heaven (like a ladder between heaven and earth. In the Messiah, we are “set free from sin and have become slaves of God, the return you get is sanctification and its end, eternal life. For the wages of sin is death, but the gift of God is eternal life in Christ Jesus our Lord.” (Romans 6:22-23) The significance of Yeshua’s statement to Nathanael was in the consequences of Yeshua being the communication path to heaven (that ladder) that facilitates a relationship with God through faith. Faith in God’s Messiah causes God’s Spirit to dwell within us and to empower our lives for righteousness a by product of the salvation that God has given. This is the liberation of the flesh into the life of the Spirit, that holy life being characterized by joining with God according to the Torah in His redemptive outreach to a hurting world. This is the description Yeshua was giving, that mightier things than these will Nathanael will see according to John 1:51 making reference to the transformation of lives for the glory of God!